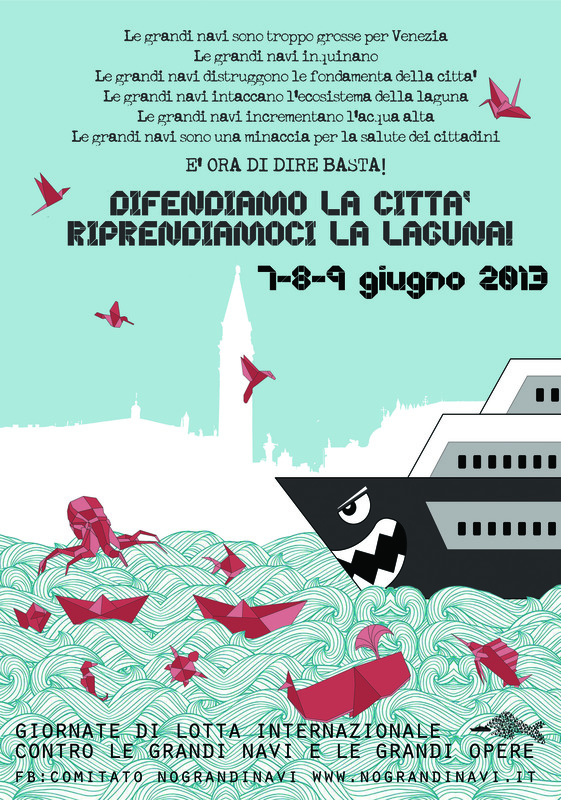 Three days of struggle to defend the ecology of the Venetian lagoon and the life of the city. Flying into Venice for a long-awaited vacation, the biggest thing we could see from the air was not the Piazza San Marco, or the Doge’s Palace, or the Basilica—the biggest thing in Venice was a cruise ship docked in the passenger port. In town an hour later, we saw the posters, which said (in Italian, of course), “Defend the City—Take Back the Lagoon—Days of International Struggle Against the Big Ships—June 7-8-9.” We had arrived just in time. “Everyone in Venice hates the cruise ships,” a young woman who worked for our hotel told us. But not quite everyone: the Cruise Venice Committee held a gala affair in October 2012, according to Barbie Nadeau of The Daily Beast, where 1,800 people gathered at the passenger terminal to celebrate the success of the city in attracting the big ships. According to the committee, more than 650 cruise ships now dock in Venice annually—two almost every day of the year—and they bring passengers who spend almost $200 million annually. Obviously, the people who run the restaurants and own the stores that sell the cheap carnival masks and little plastic gondolas have something to celebrate. During the three-day mobilization, demonstrators from out of town camped out on one of the nearby lagoon islands, where political discussions, debates and workshops were held during the first two days, with puppet shows for the children and music and partying at night—ska, Afrobeat and rock steady were listed on the program. Sunday morning, the protest began with a blockade of the road from the parking lot to the passenger terminal. While demonstrators chanted “Don’t board that ship!”, police in riot gear attacked with clubs. News photos showed the protesters protecting themselves with inflatable plastic ducks and other children’s beach toys. The event was streamed live on the web by Global Project. The climax of the three-day protest came Sunday afternoon in the water outside the cruise ship terminal: “Everyone in Boats in the Giudecca Canal!” While coast guard and police motorboats patrolled, hundreds of people in dozens of smaller boats filled the canal, flying flags that said “No Big Ships” alongside red medieval banners bearing a yellow lion of St. Mark—the historic flag of the 1,000-year-old Venetian Republic. Manila Ricci, who blogged about the protest for Huffington Post Italia, called it “a day that expressed the collective power of people.” “Venice is free,” she wrote, “at least for today.” One of the leaders of the protest committee told me the protest was “una gesto simbolico”—“a symbolic gesture.” But for a tourist from Los Angeles, it was an eloquent and thrilling event. Watch video of the protest flotilla here. The Venice Biennale opened at the end of May. Read more about the political art exhibition here.